Please Note: Our shampoo has been changed to a concentrate. Because most of our product goes out via post or courier, this reduces the freight amounts considerably. We highly recommend using a trigger spray with a diluted solution. We now have the spray bottles available if needed. this allows a very even application. Does not contain Sodium Laurel Sulphate! Because it does not irritate already sensitive skin, this helps avoid adding to the "skin itch" problems! Totally natural conditioner made with top quality ingredients. Simply wash your dog in Stopitch! shampoo, rinse well, then apply conditioner. Massage in well, then rinse out. If your dog has a really dry coat, you can also use this product as a conditioning treatment by applying it to a dry coat, leaving in for an hour or so, before following your normal shampoo and conditioning routine. You will really notice the improvement in the look and feel of the coat. Stopitch gel has a base of Organic Aloe Vera which in itself if very soothing and healing, and is also beneficial for skin and coat. Peppermint for anti-inflammatory. Herbs for healing. Aloe Vera Gel Base. You can ask for a free 60ml Stopitch! Shampoo to be included if you would like to give it a try. 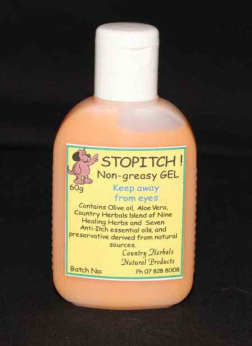 If your dog is itchy all over the Stoptich! spray may be worth a try. Always do a patch test before using these products, to make sure your dog does not have an allergic reaction to the herbs or essential oils. Skins can also be sensitive to some natural things. Why Consider an alternative to Chemical Flea Treatments? Worried about the chemicals in your flea treatments? Some of the ingredients in these are very toxic. We encourage our customers to do their own research on products they are using so they are able to make well informed decisions. The chemicals many flea treatments according to research have caused serious health problems in animals tested in laboratories. Some of these reactions include; skin irritation, vomiting, diarrhea, trembling, seizures, and respiratory problems. Among the instructions/cautions are things like "do not let contents come in contact with your skin, wash hands after use and dispose of container in a responsible manner. "We put these toxic substances onto our precious dogs skin, and it remains in their system for up to a month? Does this make sense? Fibronil is a chemical widely used now in flea treatments, and it stored in the sebaceous (oil) glands under the skin and slowly released for the duration of the treatment onto the hair and skin. The oral flea application chemicals are also stored under the skin. Is there a possible connection between chemicals stored under the skin and the nationwide epidemic of animal itch we now have? Flea Flummox is topical so it is not stored in the animals system. Our natural alternative is very effective as the active ingredients are not toxic to your dog, but have a devastating effect on the fleas ability to function. We have seen fleas that come in contact with the product stagger, and fall off. Regular use is needed to ensure your pet remains flea free! ​Our Flea Flummox contains distilled water, chitosan, derived from shrimp/crab shell, which forms a low allergenic, antimicrobial gel base, our blend of ten herbs and essential oils, and extracts of cedar wood and neem. The advantage of this product is it does not have a menthol smell that often dogs have a distinct dislike to, but they are very happy to stand and have Flea Flummox applied! Our dog sits and wags her tail when we bring it out! Then concentrates on standing very still while we put it on. It is fine for cats if applied to the inside of soft cat collar. If no collar is used, it may not be as effective as they are constantly licking themselves, and the success of the treatment relies on the fumes being present. In saying that, I was able to keep my cat flea free putting a couple of drops on the back of the neck as needed. We recommend applying it once or twice a week when there are plenty of fleas around to once a month for maintenance. For our dog of 20 kilos, I use about one ml per dose, and run it down her spine. So one 50ml bottle will do around 50 applications for a medium size dog. For Really Bad Flea Infestation situations, or for Fleas which have become resistant to normal Flea Treatments we recommend Diatomaceous Earth. This can be used directly onto pets, hens, cats and dogs, but all care must be given to avoid you or your pets breathing in the fine dust as this can cause lung problems. When using on an animal make sure you use a suitable shaker held close to the animals body, which can lay the powder gently straight onto the coat. Then gently work it into the coat. An extra person to hold the head, is a great idea, and perhaps even cover the nose and mouth with a light damp cloth might be a good precaution if your pet is cooperative. It can be used on or around your pets bed, and across doorways in your home. For bad flea problems, treating the home must also be a consideration. For more information on how this product works, simply google Diatomaceous earth.